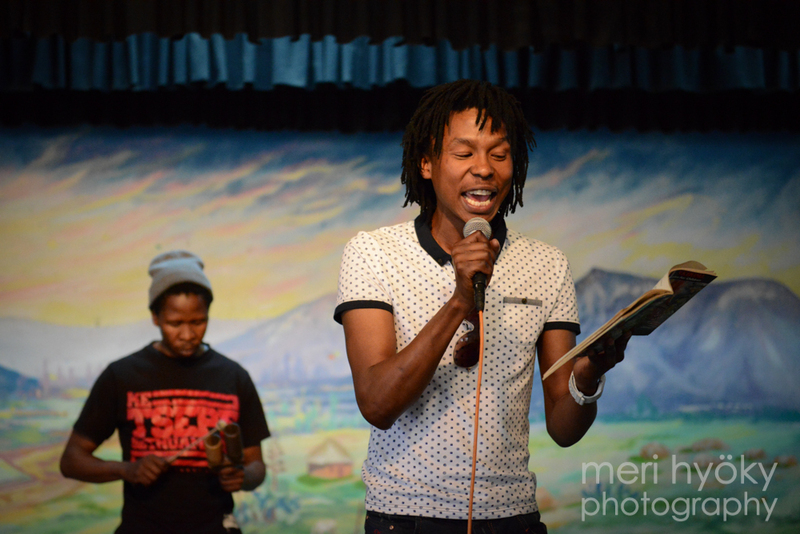 A storytelling performance at the 2014 Ba re e ne re Literature Festival. Lesotho is an interesting place to be in at the moment. At the end of August, we made headlines worldwide, unfortunately for the wrong reasons. The news had nothing to do with the country’s many unique and positive qualities. There was no mention of natural beauty, of Basotho culture, or of the many exciting initiatives that a host of organisations and individuals in the country are working hard on. Instead, it focused on the country’s current political mess. An apparent attempted military ‘coup’ took place, and the Prime Minister fled to South Africa. Tom Thabane is back in the country now, but political tensions remain high, with no clear resolutions in sight. Everyday life continues, but people are tense, confused, and many fear a repeat of the political violence that the country experienced in 1998. In the midst of this uncertainty and political instability, the weekend of 5 – 7 September saw the return of Ba re e ne re Literature Festival, the only event of its kind in Lesotho, founded in 2011 by the late Liepollo Rantekoa, a young Mosotho literary enthusiast who passed away in a tragic car accident in 2012. Inspired by Rantekoa’s vision of a movement that would reignite a culture of reading and writing in Lesotho, and especially an appreciation of Sesotho language and literature, a group of her friends and family have come together and are continuing with the work she began. 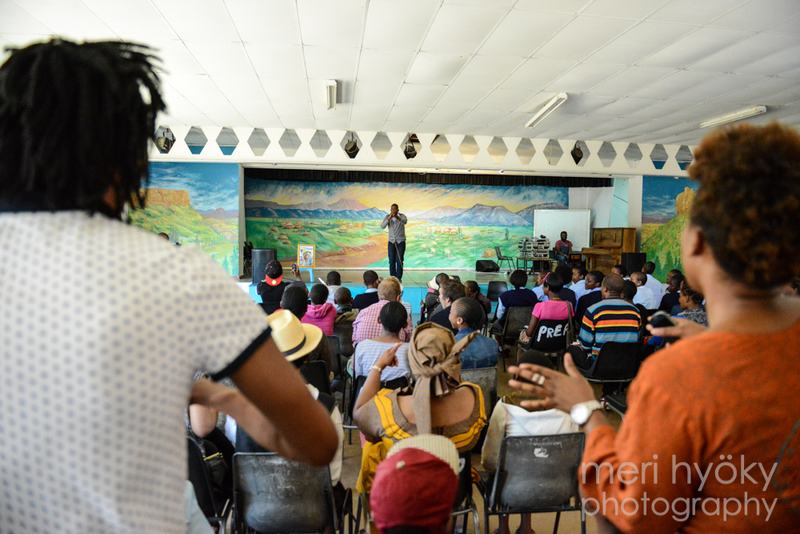 This year, a number of writers from outside Lesotho were invited to take part in the festival. These included South African novelist Niq Mhlongo, Nigerian/Barbadian writer Yewande Omotoso, and Namibian poet Keamogetsi Molapong. Cape Town-based Chimurenga Magazine jumped on board as the event’s official partner. International authors were joined by a number of writers from Lesotho, including Mpho Makara, Teboho Rantsoabe and Patrick Bereng. The festival’s opening ceremony took place at the same time that a political march was held through the centre of Maseru. Night-time events were cancelled in the face of potential security threats. But despite these challenges, people of all ages came out to enjoy the day-time events, which featured a vibrant combination of live music, poetry readings, storytelling performances and discussions with authors. Nobody ignored the political situation in the country. On the contrary, the challenges that Lesotho currently faces became a crucial talking point, as guests and participants spoke of the role that artists, writers and literature can play in times such as these. The final event of the second day of the festival saw people of all ages sitting in a tight circle around a small computer screen, laughing together at jokes told by renowned South African author Zakes Mda (addressed by the audience as ‘Ntate Zakes’) who, although unable to be present in person, joined the festival via Skype. Audience members enthusiastically join in with the chorus of a live music performance at the festival. The focus of day three of the festival shifted to more practical issues, with the authors discussing writing techniques, and sharing tips and advice with the audience. Ba re e ne re boomed with engagement, enthusiasm and positivity. The energy was palpable. Soon, we hope, the eyes of the world will turn to Lesotho for the right reasons. See more photos from Ba re e ne re by following this link.